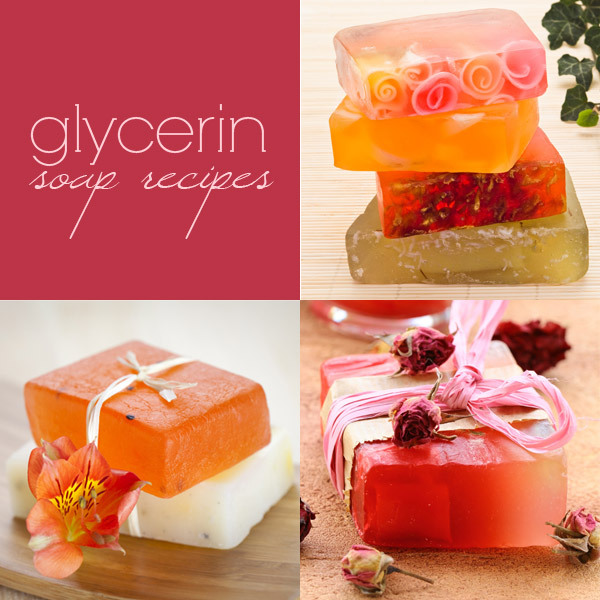 When people ask for a glycerin soap recipe, they usually mean a melt & pour recipe. 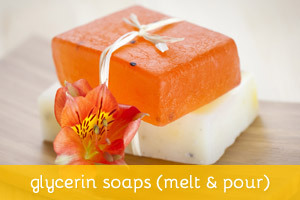 Melt & Pour (MP) is one of the easiest methods for soap making. It basically consists of buying a pre-made glycerin soap base, that can be transparent or opaque, melting it and than casting it into a mold with the desired shape, fragrances and colorants. It’s a pretty straight-forward process that even kids can do, as long as supervised by a responsible adult. Melt soap in small pan over low heat or in a glass cup in the microwave. Add Liquid Soap and glycerine and stir gently but well. Add fragrance, color and cinnamon. Stir and let stand a couple minutes, just enough to start to thicken so when you stir again the cinnamon will be more evenly distributed. Pour into molds. Allow to set completely (in or out of freezer). Wrap in plastic wrap or use cellophane candy bags. Melt soap base for tart in a double boiler. Once melted, add color and fragrance. Pour into a muffin tin and allow to harden. Remove from tin.Melt soap base for topping and add a shake of Sparkle Dust. With an electric mixer, mix until thick and bubbly. Spray tarts with rubbing alcohol and spoon the topping onto the tarts while allowing some to run over tarts. Top with a dash of Sparkle Dust if desired. Melt the MP base and stearic acid separately. Combine them when they are both liquefied. Whisk well. Add the fragrance oil and pour into a wax paper lined pan or tray. Take a bit of red coloring (just a bit on the tip of the toothpick) and swirl into the soap until it is marbleized. When it is firm enough, take cookie cutter and cut out candy cane shapes. These are great for Christmas. Combine melted soap and herbal ingredients. Stir until blended, and pour into molds. Keep soap wrapped or store in a cool dark place. It will be good for about 18 months. Note: This also works well for poison Ivy. Melt 1/2 lbs white base. Add sufficient coloring to make as dark red as possible, add 2 tsp of Cherry fragrance. Pour at least 30 “cherries” in the mold (it looks like it makes two halves of a 1 inch christmas ball). Allow to cool, unmold and set aside. Melt 4 oz of clear base. Add 2 drops of green and 2 drops of red colorant. Will turn brown. Add 3/4 tsp of Oatmeal, Milk & Honey Fragrance. Mix in oatmeal. Pour evenly into two of the springform pans. Melt 1 lb of white base. Add a few drops (only) of yellow colorant. Add 1-3/4 tsp of OM&H Fragrance, 1 tsp of blending vanilla (will add amber glow) and a small dash of lemon fragrance. Mist brown base with alcohol and pour creamy base evenly into pans – be sure to leave about 1/4 to 1/2 inch head room. Allow to cool about 20 minutes until surface is fairly solid. Spray top of “cake” and bottom of “cherries with alcohol. Arrange about 15 cherries on each cheesecake. Melt 4 oz of clear base. Add red colorant to make deep red, add 1 tsp of Cherry Fragrance. Spoon over cherries, covering them and allowing excess to flow around them. Allow cakes to cool about 30 minutes. Pop springform pan and enjoy. Mix the ingredients into the melted soap/water mixture. 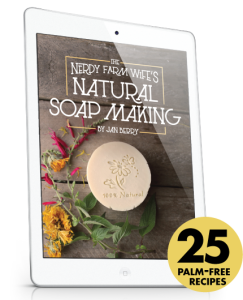 With an electric mixer, whip the soap until it has doubled in volume. Spoon the soap into the prepared molds, pushing it into the molds as best you can (the beating action cools the mix, so work quickly). If the mixture has cooled off and thickened so much you can’t put it into the molds, hand mold the soap into large balls. Melt the MP base and coconut oil. Remove from heat and whisk well. Add essential oils and whisk well. Add a few drops of yellow/orange dye. I mixed red and yellow food coloring. Pour into molds. When I want to do each the “correct” color and flavoring for each fruit wedge, I use plastic leftover yogurtcups, pour my base into it (after heated) then do the color mixing and flavoring. This glycerin soap recipe is for the coffee lovers in your life. It has a deep brown color and smells like fresh coffee when you use it. Grind two teaspoons of your favorite coffee beans to espresso grade in coffee grinder. Melt the MP. Remove from heat and add the ground coffee, whipping cream, and aloe vera gel, stirring until well blended. Pour the mixture into a mold and let set for three hours or until hardened. Melt soap and remove from heat. Add the orange oil and food coloring, stirring until well mixed. Pour half of the mixture into each soap mold and let it set for on hour. When the orange soap has set, melt the second half of MP base. Remove from heat and stir in the whipping cream and the vanilla fragrance oil. Pour the melted soap into the molds on top of the orange soap. Let it set for three hours. Your finished bars should come out half orange and half white. Enough for 2 bars. Shred the soap in a food processor and set aside. Boil 1/2 cup of water over low heat and stir in the shredded soap. Continue stirring until the mixture becomes a sticky mass, approximately four minutes. Remove from heat and stir in the aloe vera gel, the fragrance oil and the coloring until well blended. Spoon the mixture into a mold and let set for six hours or until hardened. Wrap finished soaps in cellophane. Melt soap, then add cold cream and stir until melted. Remove from heat; add fragrance and color, and then mold. This is a wonderfully creamy soap to wake up to in the morning! And everyone LOVES the scent of pure Rosemary! Men even go nuts for it! Make sure you spray your mold with a vegetable spray. Pour all of the soap mixture into the mold. After a couple of hours, push it out of the mold and slice the soap into round soaps! Important Note: Rosemary EO is not recommended for individuals with high blood pressure or epilepsy. Melt the MP soap. Remove from heat and slowly stir in the cocoa butter and enough cocoa powder to make it a pale brown or tan. Add fragrance oil. Reserve enough of the soap to make a darker brown color. Pour the lighter shade of brown soap into round/cookie molds. Add more cocoa powder to the reserved batch of MP base to make a darker brown. Marble into the pale brown soap. Melt MP base. Remove from heat and stir in the cinnamon oil and coloring until well mixed. Pour the soap into a mold and let set for three hours. Melt the soap base and at the same time melt the shea butter in a custard cup placed in a pan of boiling water or in the microwave. Add calendula petals to the melted base, a few drops of yellow food coloring, the EO and then the melted shea butter. Try to have this the same temp as the melt and pour. Keep stirring the soap/shea butter mixture. As it starts to set up spoon into heart molds (by spooning you have more control how many of the calendula leaves go into each mold.) I like to let my molds set at room temp until them are skimmed over fairly firm then I chill them in the freezer for about a half hour before removing them from the mold and place them on a rack to finish drying completely. This is a very pretty soap. Makes 8 heart soaps. *****By stirring the soap/shea butter mixture as it cools the butter will not float to the top and make little circles of butter which might look like mold to those that don’t know. Mix together all ingredients and pour into molds. Once cooled, pop out of molds, and store them in a dark cool place. Melt base and scent. Stir in cornmeal, pumice, & clay continually until it gets to the point where it will stay suspended in the soap. By this time the soap will be quite thick and cool. Pour into molds. Melt beeswax and keep warm/liquid. Melt soap base and then mix in beeswax. Add honey and keep stirring until melted. Pour into mold. This recipe looks neat in a similar mold – Milky Way Molds have a bee and a flower. I’ve also seen a great bee/honey mold (it looks like beeswax sheets on the surface) at other places. In a heavy saucepan over low heat, melt one bar of glycerin soap until liquefied. Remove from heat and stir in one drop food coloring and 10 drops fragrance oil. Pour half of the mixture into two soap molds, filling each mold halfway. Wait twenty minutes. Melt your second bar of glycerin soap until liquefied. Remove from heat and stir in the other drop of food coloring and fragrance oil. Pour this second layer on top of the first layer (already in molds). Let soap set for three hours or until hardened. Your finished bars should come out half one color and half another. With a pair of sharp scissors, cut off one square inch of loofah sponge. Shred the loofah sponge into tiny pieces, either in a coffee grinder or with scissors, and set aside. Melt MP base. Remove from heat and add the lanolin, aloe vera gel, lemon oil, and food coloring, stirring until well mixed. Immediately add the shredded loofah and stir until evenly distributed. Pour into a mold and let set for three hours of until hardened. Makes one bar. 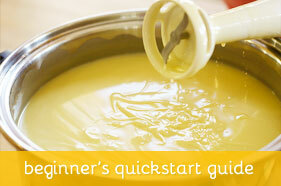 Melt the soap base over a double boiler. Add the shea butter and cocoa butter and heat until melted. Add the oatmeal and rose petal powder. Add the red colorant and continue stirring, making sure it is fully incorporated. Lastly, add the essential oils and stir well. Pour into desired soap molds and let set. Melt soap base and add mint leaves and fragrance – pour into molds. Melt opaque soap and scent. Spay confetti pieces with alcohol and place in mold. Let opaque base cool for a while until a skin has formed twice (you don’t want to melt your confetti!). Pour over confetti pieces in mold. This recipe works nice in any tube type mold (try PVC with an end cap!). If you use a tube mold you’ll want to make bigger pieces of confetti and pile them up in the mold and pour over, let harden and then slice. Shred the castile soap and set aside. Heat the water in a heavy saucepan over low heat. Stir in the shredded soap until it forms a sticky mass. Remove the pan from the heat and add the powdered milk, sweet almond oil, peach fragrance oil and food coloring. Stir until well blended. Spoon the soap into a mold and let set for 4 hours or until hardened. Makes one 4-ounce bar. Shred the Castile soap and set aside. Heat the water in a heavy saucepan over low heat. Stir in the shredded soap until it forms a sticky mass. Remove the pan from the heat and add the powdered milk, Sweet almond oil,Peach fragrance oil, food coloring; stir until well blended. Spoon the soap into its mold and let set for four hours or until hardened. Melt the soap base and coconut oil, stirring well. Remove from heat and add 1 teaspoon of the peach tea, peach FO, and peach dye (a tad of orange works fine). Pour into peach molds. Melt soap base, sugar and salt in a double boiler. Remove from heat and add sweet almond oil, colorant and fragrance oil to mix. Whisk until mixed. Pour into mold and lightly spray with rubbing alcohol. After removing soap from mold, place on drying rack for 48 hrs, then wrap. Grind the oats into a fine powder in a food processor and set aside. Melt the MP base. Remove from heat and add the raspberry fragrance oil and the red food coloring, and oat powder, stirring until well mixed. Pour into a soap mold and let set for three hours or until hardened. Melt MP base until liquefied, stir in the cold cream until dissolved, then remove the pan from heat. Stir in the rose fragrance oil and food coloring. Pour into mold and let set for four hours or until hardened. Makes one bar. Melt clear soap in a double boiler. 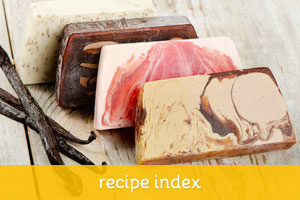 Add table salt and ½ of fragrance to melted soap base. Pour into rectangle drawer divider so soap will be approximately 1/4″ thick. Sprinkle sea salt on top. When cooled cut into triangular shapes and place pieces in Debbie’s Favorite Wilton mold. Next, melt white glycerin in a double boiler. Add castor oil, beeswax, poppy seeds and ½ fragrance to melted soap base. Pour over clear, sea salt soap triangles. Heat M&P in bain-marie, double-boiler, or microwave until melted. While it’s heating, rip open tea bag, put leaves in either coffee grinder or pestle, and pulverize them thoroughly. Add ground leaves, wintergreen oil and food coloring to melted soap, and stir. Pour into molds (you can get neat shamrock shapes at party stores! ), and let cool. Voila – St. Paddy’s Day soap! N.B. Oil of Wintergreen is said to be excellent for sore muscles. The soap smells a bit like Ben Gay (guess why? ), but is very refreshing to use. Melt MP base until liquefied. Stir in the tomato juice, red wine vinegar, and lemon oil. Remove from heat. Stir in the baking soda until dissolved. Pour the soap into a mold and let set for three hours or until hardened. Melt the MP base and coconut oil until liquefied. Remove from heat and be sure to mix well with a whisk. Add the fragrance oils and colorant. Pour into molds.